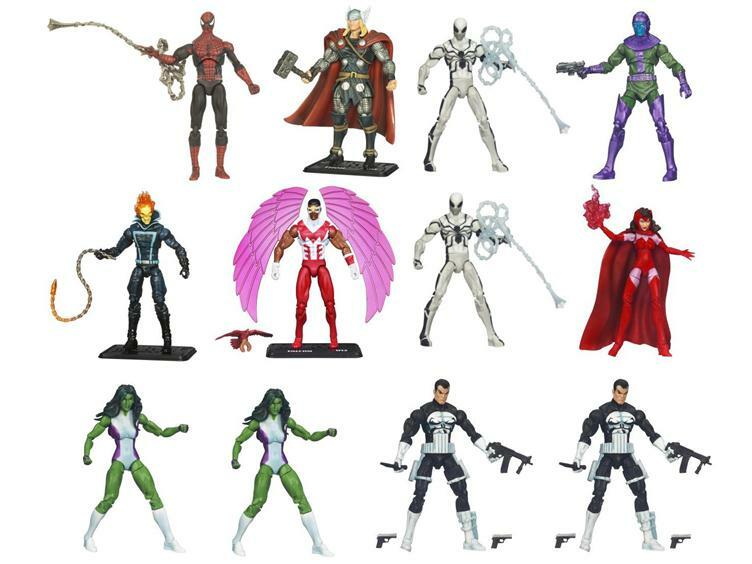 Hasbro has finally made Wave 19, including the long sought-after Scarlet Witch, Kang, She-Hulk, FF Spider-Man and The Punisher, available for pre-order, and our friends at BBTS have all the details for us after the jump. Hasbro proves once again that they don't quite get it with this case pack, as it includes two of each of FF Spidey, Punisher, and She-Hulk, but only one each of Kang and Scarlet Witch, and repacks of Series 1 Spider-Man (ok, this guy hasn't been on pegs in a while, but aren't we kind of Spidey'd out? ), modern Thor (this guy has been available in a ton of formats lately), another Ghost Rider (also in Wave 18 cases), and another Falcon (because the 20 hanging on the pegs at my local store aren't enough). So this case assortment is two-thirds awesome. But, those two thirds are all kinds of awesome. I'm looking forward to ALL the new figures in this wave. BBTS has this wave available by the case, as a set, and singles of FF Spidey, Punisher and She-Hulk. Just gimme dat Ghost Rider... and maybe a Punisher... and I'll be happy. Dude, Ghost Rider is old. You don't have to wait for this wave for him. He came out in 2010, and is included in the Wave 18 case before this one, too. Ah ok, I didn't realize he was hard to find in the UK. I thought one of the many cases he was in would have saturated over there by now. I've thought often of Brett's post regarding the distribution and case assortment as I stare at the overladen pegs here in ABQ... which seems will continue with this wave as you mentioned that Hasbro 'doesn't quite get it'. Was there ever any sort of push from collectors for a potential subscription or is that just outta the realm of what Hasbro is capable of giving their 'fat walleted' fans, like me? Great site btw, came across it about a month ago and been checking daily! I don't think there was ever a huge push from collectors for a subscription service, but I know the question was asked at least a few times at various conventions and through the old monthly Q&A that they just inexplicably stopped answering. Their answer at the time was always that they "had no plans" for a subscription service, but I wouldn't say it's completely out of the question... just very unlikely. I think for that to happen, we'd first have to see some sort of official Marvel Collectors Club form, similar to the GIJCC (which has been trying for some time now to get their own figure subscription service off the ground). Since Marvel action figures don't have quite the same history or collector following that G.I. Joe does, I'm not too hopeful about seeing a collector club form any time soon, but never say never.